La Lupe (aka La Yiyiyi, born Guadalupe Victoria Yol? Raymond, 23 Dec 1936 - d. 1992) was a Latin & salsa singer. Born in the barrio of San Pedrito, Santiago de Cuba, Cuba - her father was a worker at the local Bacardi distillery and was a major influence on her life. He strictly encouraged her to become a school teacher. Just like her counterpart, Celia Cruz, she was a schoolteacher before she became a singer. Born in the barrio of San Pedrito, Santiago de Cuba, Cuba - her father was a worker at the local Bacardi distillery and was a major influence on her life. He strictly encouraged her to become a school teacher. Just like her counterpart, Celia Cruz, she was a schoolteacher before she became a singer. She married in 1958 and formed a musical trio with her husband Eulogio "Yoyo" Reyes and another female singer. This group "The Tropicuba Trio" broke up with the marriage in 1960. She began to perform her own act at a small nightclub in Havana, La Red, and acquired a devoted following also appearing on radio. 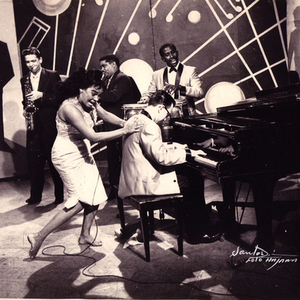 She released her first album, Con el Diablo en el Cuerpo (With the Devil Inside) on Discuba in 1961. Her expressive performances with their violent sexuality attracted criticism that she was a poor example to the revolutionary state, this led to professional difficulties which together with personal problems made it difficult to stay in Cuba. In 1962 she found herself exiled to the United States. In New York City she performed at a cabaret named La Barraca, where she was discovered by Mongo Santamaria and started a new career, making more than 10 records in five years. Her passionate performances covered the range of Cuban music: son montuno, bolero, Guantanamera venturing into other Caribbean styles like merengue, boogaloo, golpe tocuyano, busamba, salsa. In the sixties she was the most acclaimed Latin singer in New York City due her partnership with Tito Puente. She was the first Latin singer to sell out a concert at Madison Square Garden. She also did a wide variety of cover versions in either Spanish or accented English, including "Yesterday", "Dominique" by The Singing Nun, "Twist & Shout", "Unchained Melody", "Fever" and "America" from from the play/film West Side Story. A devout follower of Santer?a, she continued to practice her religion regardless of the influence, fortune, and fame she had acquired throughout the height of her career. However, due to the decision by her record label, Fania Records, to end her contract in the last 1970s (mainly because the label wanted to focus on the less controversial, yet commercially-successful Celia Cruz), she saw herself destitute by the early 1980s. After being led to believe she was miraculously healed by an evangelical Christian faith healer, she abandoned her Santeria roots and became a born-again Christian. She died in the Bronx and was survived by her husband William Garcia, their daughter Rainbow, and her son Rene Camaro (whose father was Eulogio Reyes). She is interred permanently in Saint Raymond's Cemetery in the Bronx. In the 1990s, interest in her music was re-sparked when Pedro Almod?var included "Puro Teatro", one of her boleros of love and breakup in his film classic Women on the Verge of a Nervous Breakdown. Due to her similarities to American singer Judy Garland such as her strong, yet raspy voice, and her energetic and unpredictable stage performances, she has become an icon among many gays in Latin America and Spain. In 2002, The New York City renamed East 140th Street in The Bronx as La Lupe Way in her memory.